Created a beautiful and interesting PowerPoint presentation or Microsoft PowerPoint Slide Show in .ppt, .pps, .ppsx or .pptx format, complete with sound and music, for your wedding ceremony or corporate marketing event. But alas, in an unlucky situation, the DVD or VCD player on Hi-Fi amplifier system cannot player PowerPoint slide out of the box, even with Pack and Go feature. Worse if the projection system or display panel won’t connect to your laptop VGA output port. In this case, you may want to convert the Office PowerPoint presentation in .ppt or .pptx or .pps or .ppsx format to a video, recorded on CD or DVD disc or even on VHS tape which almost everyone can playback on any DVD player. PowerPoint has a “Package for CD” (in Office 2007 or later) or Pack and Go (in Office 2003) option that copy your presentation, supporting files such as audio or video together with a Microsoft Office PPT PowerPoint Viewer to an optical disk, USB flash drive or network location. However, even if PowerPoint burns the packaged presentation to CD or DVD, the disc created is still a data CD or data DVD which can only be played back on a computer (even if PowerPoint is not installed), and not playable in DVD player normally attached to TV. For an universal playable presentation, it’s your best bet to convert the presentation to video clip instead, and best of all, a Video CD (VCD) or Video DVD. To showcase your presentation online via website or blog, you can convert the PowerPoint presentation to Flash based animated content too, but Flash standard is now mostly deprecated in modern desktop and mobile web browser. In PowerPoint (except in newer versions of PowerPoint since PowerPoint 2010), you won’t be able to create and burn a Video CD or DVD with CD/DVD burning software such as Nero or DVD authoring programs such as Nero Vision, Pinnacle Studio, Ulead DVD Movie Factory, Apple iDVD, MovieStudio + DVD, MyDVD Studio, Sonic DVDit, Adobe Encore DVD and etc. Instead, you have to rely on various PowerPoint to Video converters, PowerPoint to DVD converters or PowerPoint presentations to Flash converters. Most of the converters can convert PowerPoint presentations to multiple formats, however, most of the software is not free, and users will need to purchase or buy a product key or registration number by paying license fee. However, most also available for free download as a shareware or trial usage, which allows you to evaluate which PowerPoint converter best suit your need, especially if you’re using new file format and extension (.pptx or .ppsx) of PowerPoint 2007 or later. Downside is that all video created in demo mode likely to imprint and stamp with watermark. Beginning from PowerPoint 2010, Microsoft PowerPoint has the ability to export and save a presentation as a video. In PowerPoint 2010, Windows Media Video (WMV) is supported, while MPEG-4 (MP4) support is added in PowerPoint 2013, PowerPoint 2016 and later. Click on File tab, then click on Save As. In the “Save As” dialog box, select Windows Media Video or MPEG-4 Video (aka MP4, only available in PowerPoint 2013, PowerPoint 2016 or later) in “Save as type” drop down list. Click on File tab, then click on Export. Optionally, select the presentation quality, whether to use the recorded timings and narrations when exporting to video, and seconds spent on each slide. Hit Create Video button when done. In the “Save As” dialog box, select MPEG-4 Video or Windows Media Video in “Save as type” drop down list. Wondershare PPT2Video converts PowerPoint presentations to poppular video formats such as AVI, MP4, WMV , 3GP, MOV, MPEG FLV and HD video for widespread share and demonstration, so that the video presentation can be uploaded and hosted on video sharing sites like YouTube, Hulu and Yahoo Video, or distributed via portable devices iPod, iPhone and Pocket PC. Download free version of WonderShare PPT2Video. PPT2DVD is a powerful PowerPoint to DVD tool to create engaging DVD presentation. It perfectly turns PowerPoint presentations to video movies and burns PowerPoint to DVD. PPT2DVD enables users to convert PowerPoint to DVD with DVD menus and control the playback with a remote control. PPT2DVD features ability to keep the exact PowerPoint animations, transitions, sound tracks, movie clips and even the inner hyperlinks, PAL and NTSC TV mode support, selection of resolutions to fit different screen size, supports all DVD regions, MPEG-1 or MPEG-2 video supported, and work with Microsoft Office 2000/2002/2003/2007/2010. Download WonderShare PPT2DVD free trial (ppt2dvd_trial.exe) from its homepage. Wondershare PPT2Flash Professional and Standard (lesser features version) offers a timesaving, reliable and effortless PowerPoint to Flash conversion tool that provides way to create high quality and professional rich-media presentations in Flash slide show format for easy publishing, and delivering over network. It inherits the strength of Microsoft PowerPoint, and extended it with smaller file size (90% file size reduction compared with PowerPoint), greater multimedia integration, easier accessibility and more trusted security. Ideal for web presentation, computer based training and e-Learning. PPT2Flash keeps most animations, transitions and background music in its accurate conversion. Download WonderShare PPT2Flash Standard Trial (ppt2flashStd_trial.exe) or WonderShare PPT2Flash Professional (ppt2flash_trial.exe). PowerVideoMaker Professional is a perfect solution for converting Powerpoint to video in crystal clear resolution in AVI , MPEG or WMV format. It preserves animations, graphics, transitions, audios and narrations from the original PowerPoint Presentations. PowerVideoMaker also supports “Automatic Timing”, “Rehearse Timing Now” and “Use existing Timings” timing method. 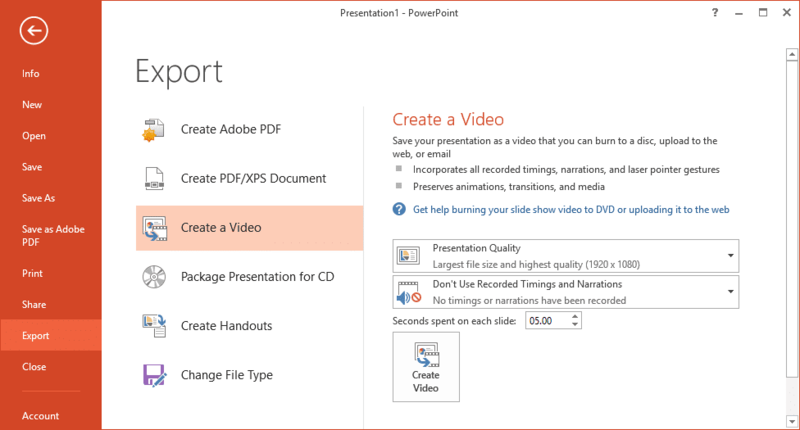 With PowerVideoMaker, you can use PowerPoint as a video-production tool. In a few steps, you can distribute your PPT presentations to anyone, whether they even have a computer or not. Download PowerVideoMaker (powervideomaker.exe) from PresenterSoft. Camtasia Studio is essentially a screen recorder and video editor that easily record anything you see on your screen to create compelling training, demo, and presentation videos, and then convert and share the screen capture in all the popular file formats – including MP3, iPod video, Adobe Flash (SWF and FLV), AVI, WMV, QuickTime (MOV), RealMedia (RM), animated GIF and even an executable (EXE) file. To make the PowerPoint conversion easier, a Camtasia Studio PowerPoint add-in PowerPoint Add-In Toolbar has been released for free download for complete PowerPoint recording and publishing, where it will automate the process to record all multimedia elements of your live PowerPoint presentation, including animations and voice narration, and publishes it on a web site or on CD. Download Camtasia Studio 30-Day Free Trial (camtasia.msi) from TechSmith. PPT To Video Scout converts PowerPoint presentations (PPT) into AVI, MPEG, WMV, DivX, xDIV, VideoCD, FLV (flash video) video movies with sound. Both NTSC and PAL plus custom resolutions and frame rates are supported. Supported conversion modes include Normal (as viewed by F5 in PowerPoint), Automatic Slide Show and Manual mode. Works in Windows 98/Me/2000/XP/Vista. Download PPT To Video Scout (PPTToVideoScout.exe) from ByteScout. PPT to SWF Scout converts PowerPoint presentations (PPT) into standalone ready-to-view SWF (ShockWave) Flash movie presentations with navigation. It preserves fonts, headers, raster and vector pictures and provides high-quality conversion, features support for customizable navigation buttons for flash movie, support for keyboard (space, backspace etc) in generated flash presentations and has customizable preloader options (text and logo image). PPT to SWF Scout is a free software. Download PPT To SWF Scout (ppttoswfscout.zip) from ByteScout. Presentations to Video Converter lets you easily transform your Microsoft PowerPoint (*.ppt and *.pps) presentations into any video format supported by your system so that you can instantly create AVI, ASF, WMV, MPEG, VOB, MP4, a flash files in SWF format, animated GIF and burn your presentation to DVD, even without PowerPoint installed on the system. You can put your presentation, for example, to a Web site for streamed viewing or Web casting. Presentation to Video Converter is effective and very easy to use, requiring only few mouse clicks to create a full featured video, flash with sound track. You can also control the presentation while it’s being converted. Download Presentations to Video Converter (presentation-to-video.exe) from GeoVid (no longer available). PowerPoint to Video converts PowerPoint presentations into video [AVI] file. PowerPoint to Video can nearly keep all the original animations and special effects in your PowerPoint file on the video file, and can attached the sound from microphone,CD player, background music etc. Certainly, you can burn these video file to VCD/DVD disc that can play on TV, DVD players etc. Download PowerPoint to Video (PPTToVideo.exe) from AboilSoft. PowerPoint to DVD lets you easily convert PowerPoint presentations (ppt) into video files (AVI) with sound track, and it can produce a DVD disc which can play on any DVD player or PC. PowerPoint to Video DVD can nearly keep all the original animations and special effects in your PowerPoint file on the video file, or can attached the sound from microphone, CD player, background music etc. Download PowerPoint to DVD (ppt2dvd.exe) from AboilSoft. PowerPoint DVD Converter enables you to convert your PowerPoint presentations to MPEG movie, or burn to DVD/MiniDVD disc for permanent data backup or sent to others as gifts. PowerPoint DVD Converters also preserves the texts, graphics, audio tracks, videos and transitions of the original, with a quality loss less export. A variety of parameters for you to set to gain a perfect copy of your original PowerPoint presentations on maximum. Download PowerPoint DVD Converter 15-day trial (pdc.exe) from its homepage. PPTmovie converts PowerPoint presentations to video in all major formats including AVI, MPEG-1, MPEG-2 (for DVD), MP4 (for iPhone or iPod) which gives you plenty of options on how to use your videos, including publishing to YouTube. PPTmovie also allows users to record your narrations or record any music from your speakers. Various slides advance choices are also available. Download PPTmovie (PPTmovie.exe) from PPTexpert (no longer available). DVDShow enables you to convert your PowerPoint presentations to MPEG movie, or burn to DVD/MiniDVD disc for permanent data backup or sent to others as gifts. Since the wide spread use of DVDs, a DVD_based presentation is becoming more and more acceptable and desired by people. It also highly preserves the texts, graphics, audio tracks, videos and transitions of the original, with a quality loss less export. A variety of parameters for you to set to gain a perfect copy of your original PowerPoint presentations on maximum. Download DVDShow for PowerPoint (dvdshow.exe) from KeronSoft. PPTonTV converts and burn your PowerPoint to DVD,and Play it on TV. PPTonTV PPT2DVD Builder can also convert PowerPoint to video, such as MPEG, AVI. Download PPTonTV (pptontv.exe) from FlashDemo. FlashPoint PowerPoint to Flash Converter helps to create professional-look flash presentations and e-learning courses with ease. It can retain the original animations, slide transitions, timings, callouts; preserve narration, sound, animation sound effects; create Flash movie in extremely reduced file size; and is extremely fast and easy to use. It’s compatible with PowerPoint 2010 and Windows 7. Download trial version of FlashPoint (flashpoint.exe) or FlashPoint Pro (fpro.exe) from its FlashDemo. Moyea PPT to DVD Burner Lite or Moyea PPT to DVD Burner Pro is a professional tool to convert PowerPoint presentations to DVD video files for wider sharing and distribution with enhanced pleasure. Moyea PPT to DVD Burner supports Windows Vista and PowerPoint 2007, and features ability to 100% retain the original animations, transitions and other special effects, generate a DVD menu in the presentation for remote control, customize the presentations with background music and narrations, burn the video files to DVD with the built-in burning engine to DVD and Blu-ray Disc , and provides synchronization of sound and animation. Downloa Moyea PPT to DVD Burner Pro (PPT2DVD_Setup.exe) or Moyea PPT to DVD Burner Lite (ppt2dvd_lite_setup.exe) from its homepage. ProDVD’s PowerPoint DVD Maker converts your ordinary PowerPoint presentations into exciting DVD movies and saves them on recordable DVDs. Your presentation DVDs are truly portable and will play perfectly on any DVD player or PC. PowerPoint DVD Maker supports PowerPoint 2000, 2002, 2003 and 2007 versions, preserves all text, graphics, transitional effect and sound. The program also features support for all major DVD burners on all DVD media types such as ?R, -RW, +R, +R DL, +RW and RAM. Supports video files such as wmv, avi and mpg. Download ProDVD PowerPoint DVD Maker trial version (ProDVD-PowerPoint-DVDMaker-Trial-Setup2-0.exe) from ProDVD (no longer available). Smart PPT Converter can convert PowerPoint to video and supports all popular formats: AVI, MPEG, WMV, Flash and more. It keeps all the special effects of the original PowerPoint file: sounds, animations, transitions for professional looking videos. The Pro version has manual conversion mode, record to DVD and add narration ability. Download Smart PPT Converter Standard (smart-ppt-converter-setup.exe) or Smart PPT Converter Pro (smart-ppt-converter-pro-setup.exe) from its homepage. There are potentially a lot more this kind of PowerPoint PPT or PPTX to Video or DVD converters available in the market. But also take note that some programs apparently have not been updated for a long time, and thus may not work in Windows Vista, Windows 7, Windows 8, Windows 8.1 or Windows 10, and with latest version of Microsoft Office PowerPoint 2007, PowerPoint 2010, PowerPoint 2013 or PowerPoint 2016.